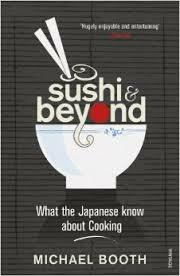 "Sushi & Beyond" by Michael Booth is a book that I've now read three times. If you love Japanese food, and travel stories, this book is essential for you! Booth is challenged by a Japanese friend on his belief that Japanese food is bland, and steals all its best ideas from other countries. With his wife and sons (6 and 4), he goes on a journey to taste everything, from Hokkaidou in the North to Okinawa in the South, and everywhere in between. He meets sumo wrestlers, beef farmers, JPop stars, and countless chefs and scientists. 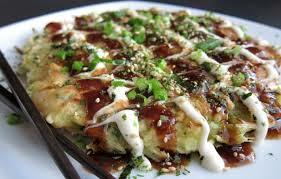 He spent three months in Japan and left a convert to the deliciousness of Japanese food. Reading this book makes me so hungry, and when I go to Japan this summer I'm planning on following in some of Booth's footsteps. I know that I need to experience izakaya (pub) food, okonomiyaki in Osaka (see the picture on the right), and ramen in Fukuoka. I'd also really like to try temple food. Anyone who knows me knows how much I love tea. I'm a big fan of Japanese tea, so here's a wee post about three different types of tea you can get in Japan. Most people have heard of matcha, which is green tea grown in the shade (just before harvesting, not for the whole time), steamed then powdered. This is the tea used in tea ceremonies. Gyokuro is also grown in the shade and steamed, but it's not powdered. These tea leaves smell absolutely amazing and the tea is quite sweet and mellow. Sencha is grown in the light then steamed. The tea tastes quite different, being less sweet and more refreshing. Mostly Miss Ferguson, maybe some club members?